President Uhuru Kenyatta was yesterday urged to release the names of the over 60 businessmen whom statehouse had reported accompanied him to Russia and China. Civil society organizations took a swipe at the president’s entourage, claiming majority were vulture capitalists who were using government forays in the East to make fortunes for themselves, rather than the citizens of Kenya, whom Uhuru is accountable to. 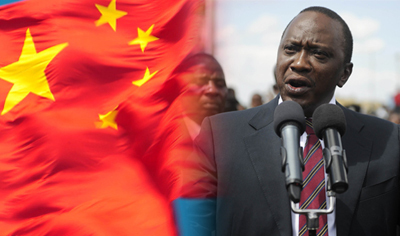 “We need to know the significance of each of those shadowy faces holding the President at ransom in China; their economic worth and public value,” said a concerned civil society activist, adding that ‘not all companies listed at the Nairobi stock exchange serve public interest’. Statehouse, in his media alert to the public, revealed that a huge delegation of Kenyan businessmen-paying their own bills-were accompanying the President to the high level bilateral meetings with the People’s Republic of China. “If they are paying their bills, whose interest are they serving?” wondered another. The civil society organizations are said to be organizing a petition to force President Kenyatta to release details of these characters to avoid the already damning perception that they are people who oiled his presidential campaigns, many from his community, and whose dealings with the rest of the country is sadly known. Supporters of the Coalition for Reforms and Democracy, CORD, also weighed in, claiming the president’s secretive way of carrying out public affairs is worrying. “When FDM (Father of Modern Democracy) was in the USA the other day, even kindergarten pupils from Kacheliba to Lungalunga know who were in his entourage. Raila Odinga deals with his people in public,” said Muuna, whose other name is Kiptoo. While it is the first time Kenyan businessmen are part of a president’s official delegation to a foreign country, opinion is divided whether our country’s political-industrial complex serves the common good which the president is elected to protect. “For so long, when you mention businessmen, those are jackpot hunters from a given community and we know they are not social entrepreneurs. By nature, they accumulate wealth for individual gain, yet President Kenyatta is supposed to accumulate collective wealth for the country. There is going to be a big conflict of interest. Wait and see,” said a Nairobi passerby on his way to Kakrao, Migori County. The bottomline is, Kenyans are anxious to know the great industrial magnets whom President Kenyatta went to China to solicit billions. List please! ?